This photo shows Service for Peace volunteer Marissa Carlson and new friend Evelyn. 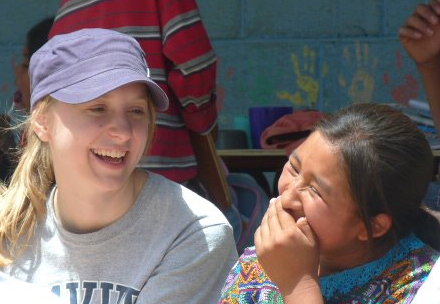 Marissa joined an Alternative Break through Xavier University in March 2012 and helped to construct an all-purpose sports court attached to the primary school in our Guatemalan CP of El Quimal. This photo highlights the friendships built through cross-cultural service.